As Crew First Pilot - Eleven missions (88, 91, 94, 95(A), 97, 99, 100, 102, 103, 104, 108). As formation element Leader Pilot -Ten missions (105, 109, 110, 112, 120, 122, 125, 132, 133, 136). (A) Non-credited aborted mission. For Mission dates, targets and Mission Reports, see Combat Missions. Litman (P) - Upgraded from CoPilot (Lester A. Lake, Jr. 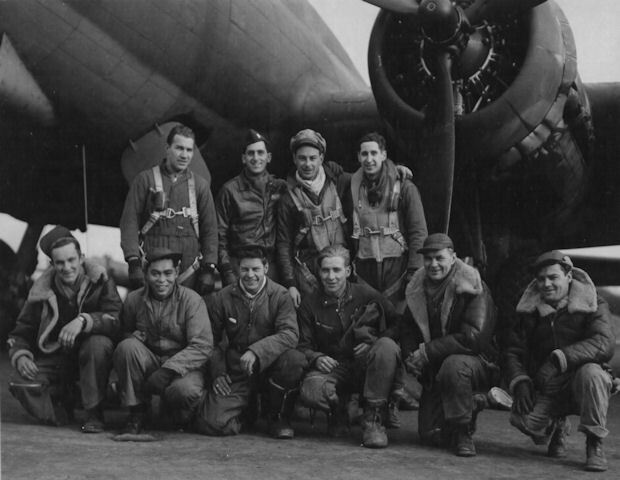 Crew) to Pilot on mission #88 12/13/44. Became a Lead Crew Pilot on mission #109 20 Feb 44. Completed combat tour on 18 Apr 44. Volunteered for a second combat tour as a Lead Pilot on 17 July 44. On 10 August 1944 Capt Litman (P) and 2Lt G.L. Conley (CP) were on a local transition flight in #42-97298 The Floose with a six man crew. The co-pilot was practicing landings and made a hard tail-first landing. Capt Litman immediately applied full power and went around for another approach. The tail wheel was inspected and was found to be damaged. Capt Litman then made a wheels first landings, the tail wheel collapsed when it made runway contact and the tail was dragged long enough to clear the runway. Capt Litman was an Evadee on the 15 August 44 mission #229 to Wiesbaden, Germany in B-17 #42-37838 Fearless Fosdick (358BS) VK-A. His B-17 went down in flames after a flak hit in the nose section that mortally wounded the Bombardier (1 KIA & 8 Evd). Returned to Molesworth and transferred to USA on 13 September 1944. Merthan (N) - Flew thirteen missions with Litman crew. Substitute Navigators were then utilized by Litman crew. Became a Lead Crew Navigator on 22 February 1944 and flew twelve lead crew missions. Last mission on 03 June 1944. Lawson (RWG) - Flew nine missions with the Litman crew. Was hospitalized following mission #108, 11 Feb 1944 with an illness and substitute crewmen were utilized. Rejoined Litman crew on 9 March 1944 and flew five missions. with Litman crew (#120, 122, 125, 132 & 133). Flew one mission with the Ferguson Crew (#123) , Snyder Crew (#136) and six missions with the Hofmann crew (#124, 127,129,130, 134 & 140). Interned in Switzerland on 24 April 1944 mission to Oberpfaffenhofen, Germany in B-17 #42-31669 Shoo Shoo Baby (358BS) VK-J, Lt R. Hofmann Pilot. Landed at Zurich with two engines inoperative and low on gas. Smith (E)(*)(#) - Flew all of his missions with Litman as Pilot. Reassigned to 358th BS in July 1944 and flew four additional missions (#208, 211,214 & 221) with Capt Litman as Pilot. TO USA 9 Nov 1944. Ebbighausen (R)(*)(#) - Flew all his missions with Litman as Pilot. Reassigned to 358th BS in July 1944 and flew five additional missions (#205,208,211, 214 & 221) with Capt Litman as Pilot. To USA 9 Nov 1944. Gibbs (BT)(*)(#) - Replaced by S/Sgt Leon J. Witherwax for eight missions 22 Feb to 18 Mar 1944. Flew 13 missions with the Jack Watson Crew between 11 Feb and 20 Mar 1944. Rejoined Litman crew on 9 Apr 1944 for four missions. Reassigned to 358th BS in July 1944 and flew 4 additional missions (#205, 208, 211 & 221) with Capt. Litman as Pilot. To USA 9 Nov 1944. Miller (LWG)(*)(#) - Flew all of his missions with Litman as Pilot. Reassigned to 358th BS in July 1944 and flew one additional mission (#205) with Capt Litman as Pilot. TO USA 9 Nov 1944. Castillo (TG)(#) - Flew all but one of his missions with Litman as Pilot. Reassigned to 358th BS in July 1944 and flew three additional missions as Waist Gunner (208, 211 & 221) with Captain Litman as Pilot. To USA 9 Nov 1944.